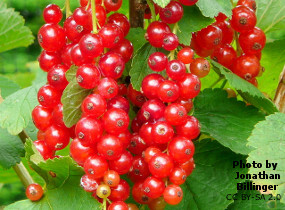 RED CURRANT, JONKHEER VAN TETS (Ribes rubrum Jonkheer van Tets). Fruit. Early cropping variety. Large bright good flavoured, firm berries in large easily picked bunches. Moderate growth. Excellent for jelly. Self-fertile. Self-fertile. Plant 6ft (1.8m) apart.